God forgive me, but that is one frightfully ugly beast. The picture actually startled me when it first came up on my screen. The cat may very well be sweet and gentle but his appearance sure takes some getting used to! Cats do not like to be called vampires. LOL! I have never really been fond of cat breeds and that photo is a great argument for avoiding them ... a vampire kitty! Oh, well, now, the picture of this poor cat or kitten is such that it tells me loud and clear that some real investigation needs to be done in order to ascertain why the critters of this order end up this way. After all, this is NO NORMAL kitten or cat, and like a person stated in a comment included in your homepage, this kitty appears of a somewhat demonically twisted order of influence. I won't say that demonic matter is at all involved, but this kitty certainly is awfully strange. Of course, take any fur-bearing animal and remove all of the fur, then we can again end up with similarly appearing results, but this nevertheless justifies very careful and thorough, enough anyway, investigation, and one that is performed not by only RCs or Christians of any other denominations, or bla bla bla, but at least a few groups of researchers qualified for this and of no relation to one another, except being human beings, of course. Romania, it's close enough to where the Chernobyl nuclear disaster occurred some decades ago, and plenty of adverse affections due to this indicident continue to be and strongly so reported today, so maybe this kitty is a victim of all of this radiation that persists and which is something far too many people in positions of "authority" refuse to admit to being true (but then truth is enemy of state, very often anyway, so ...). One way or another, this is no normal kitty. Actually, this isn't a Romanian breed per se. 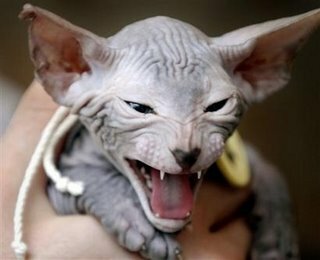 It's been around for several years and it looks like a normal cat without hair when it's not yowling like this one. Bambi, Punkie, and Paloma (1978) found in Toronto, ON, Canada and raised by Shirley Smith. Other hairless breeds might have different body shapes or temperaments than those described above. There are, for example, new hairless breeds, including the Don Sphynx and the Peterbald from Russia, which arose from their own spontaneous mutations. The standard for the Sphynx differs between TICA and FIFE. Sphynx hairlessness is produced by an allele of the same gene that produces the Devon Rex, which has only one of the usual two fur coats. The Sphynx allele is incompletely dominant over the Devon allele; both are recessive to the wild type. Sphynx were at one time crossbred with Devon Rex in an attempt to strengthen this gene, but unfortunately this led to serious dental or nervous-system problems and is now forbidden in most breed standards associations. The only allowable outcross breeds in the CFA are now the American Shorthair and Domestic Shorthair. Other associations have different rules. In Europe mainly Devon Rex has been used for outcrosses. The cat in the page Woodeene provided a url for strikes me as normal enough, just very short-haired. But the kitty in this page here, this certainly is no North Country kind of cat; it'd freeze in no time up here, if allowed to roam about freely, like many or most rural people let their pets do. So if these are possessed by people in the north, where it gets sometimes mighty cold, then these types of cats must surely have to be kept indoors during winters, and other cold days, or else need to be dressed up in some kind of "clothing" or a wool blanket, say. Hopefully, we don't have just more stupid humans stupidly tinkering with genetics, to create these types of cats. That it happens naturally, such mutations, no problem, am not going to argue with Mother Nature, but to do this with genetic tinkering, slap the idiots upside the heads and tell them to WAKE UP; sounds good to me.